What's in background checks bill? In the wake of the deadly mass shooting at a school in Parkland, Florida, calls for lawmakers to step up and revise the nation's existing gun laws have been renewed. Many of those calling for stricter gun purchasing guidelines point to the gunman himself, Nikolas Cruz, and his past history of mental health problems, questioning how he was able to obtain a weapon so easily. Though Congress has tried and failed to pass even limited gun-related legislation in recent years, one measure appears to have some momentum -- the "Fix NICS" bill of 2017. Late last year, a gunman with a history of domestic violence was able to legally purchase an arsenal of weapons, which he would later use to open fire on parishioners at the First Baptist Church in Sutherland Springs, Texas. That shooting left 26 people died and at least 20 others injured. The U.S. Air Force had failed to submit the shooter's criminal history, that is, his court martial over bad conduct, to the FBI, as required by Pentagon rules. His history should have barred him from purchasing guns. After that shooting, some lawmakers tried to come up with a bipartisan answer to fixing the way in which existing background checks can prevent firearm purchases by those who present possible red flags to state and local authorities. "For years agencies and states haven't complied with the law, failing to upload these critical records without consequence," Sen. John Cornyn, R-Texas, said following his bill's introduction. He added, "This bill aims to help fix what's become a nationwide, systemic problem so we can better prevent criminals and domestic abusers from obtaining firearms." The "Fix NICS Act" aims to increase state compliance with and improve the accuracy of existing background check systems for firearm purchases. It would ensure that federal and state authorities comply with existing law and accurately report relevant criminal history records to the National Instant Criminal Background Check System (NICS). The bill also penalizes federal agencies that fail to properly report relevant records and incentivizes states to improve their overall reporting. It also directs more federal funding to the accurate reporting of domestic violence records. Creating a Domestic Abuse and Violence Prevention Initiative to ensure states have adequate resources and incentives to share all relevant information with NICS showing that a felon or domestic abuser is excluded from purchasing firearms under current law. The bill was first introduced in November by Sens. John Cornyn R-Texas, Chris Murphy, D-Connecticut, Tim Scott, R-South Carolina, and Richard Blumenthal, D-Connecticut, along with Senators Orrin Hatch R-Utuah, Dianne Feinstein, D-California, Dean Heller, R-Nevada, and Jeanne Shaheen D-New Hampshire. Cornyn said in a statement on Monday that the measure has also been endorsed by groups like the National Rifle Association, National Shooting Sports Foundation, National Coalition Against Domestic Violence, Fraternal Order of Police, National Network to End Domestic Violence, National Sheriff's Association among others. 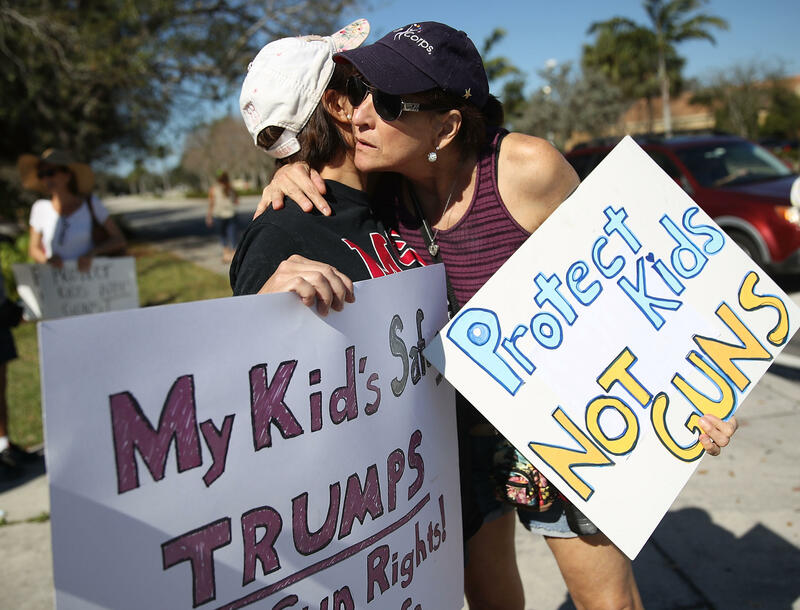 Like many bills before it, the latest attempt to modify the nation's gun laws in the aftermath of a deadly mass shooting likely faces an uphill battle on Capitol Hill. So far the measure has passed the House and is in the Senate Judiciary Committee. Since President Trump has expressed his willingness to lend his support to legislation that would improve the gun background check system, its prospects may improve. According to a statement released by the White House Monday morning, "The President spoke to Senator Cornyn on Friday about the bi-partisan bill he and Sen. Murphy introduced to improve Federal Compliance with Criminal Background check Legislation." The statement continues, "While discussions are ongoing and revisions are being considered, the President is supportive of efforts to improve the Federal background check system." Cornyn also released a statement after the president expressed his willingness to lend his support to such legislation, saying "It's clear the President is interested in getting something done." But bill's co-sponsor, Chris Murphy, a vocal critic of Congressional inaction on common sense gun reforms, tweeted on Monday that their bill alone can't fix the persistent problem of mass shootings. Murphy shares Cornyn's optimism, however, saying that Mr. Trump's support of the legislation is "another sign the politics of gun violence are shifting rapidly."